Congratulations to Craig & Kelly! 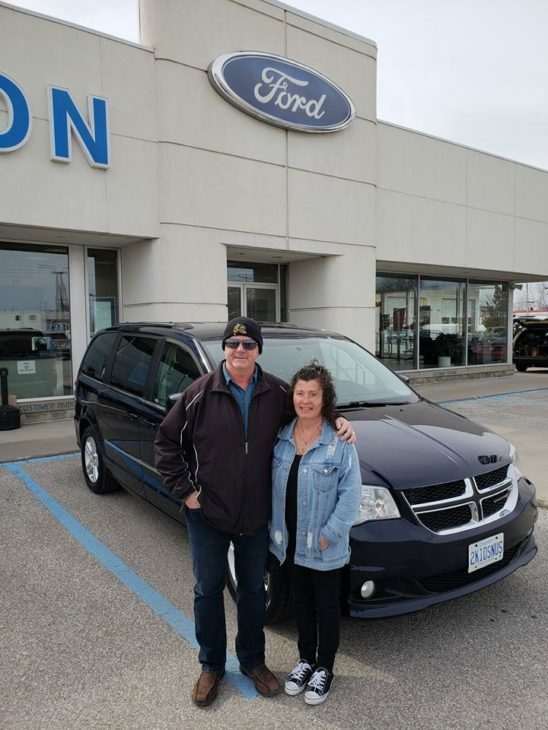 The winner of the 2019 Lambton Ford Second Chance Draw! Sandy Point Group is excited to join Lambton Ford and add to the current Lambton Ford Second Chance Draw Prize Package. In addition to the current Second Chance Draw prizing, fans who purchase a 50/50 ticket at Sarnia Sting home games will now have the opportunity to win an all-inclusive three (3) night stay at COCOBEACH Laid Back Luxury Resort with flight and accommodations included. Simply follow the link on the bottom of your 50/50 ticket to enter or follow the link here.. Click here to learn more about COCOBEACH Resort. In partnership with the Sarnia Sting Hockey Club and Lambton Ford, Sandy Point Group hopes the inclusion of a tropical getaway to the Second Chance Draw Prize Package will encourage more fans to purchase 50/50 tickets at Sting home games. All proceeds from the 50/50 draw go to support the development of minor hockey in the Sarnia-Lambton Area. Learn more about the Friends of Sarnia Minor Hockey and 50/50 proceeds here. After a record-breaking season of 50/50 jackpot totals at Sarnia Sting home games, the Sting and Lambton Ford are pleased to reintroduce the Lambton Ford Second Chance Draw. Operated by the volunteer group, Friends of Sarnia Minor Hockey (formally known as Sarnia Sting Booster Club), the 50/50 raffle is a pillar in the Sarnia Sting’s community outreach program. Not only do Sting fans have the opportunity to leave home games with a little extra cash but also help the youth of our community. All proceeds from 50/50 raffles are donated to minor sports and youth programming in the Sarnia Lambton area. Over the past 25 seasons over $1,000,000 has been given back to our community. The Lambton Ford Extreme Car Make-Over which includes a brand-new set of tires, a complete interior/ exterior vehicle detail and the Works Service Package. Sting President Bill Abercrombie comments on the Lambton Ford initiative: “Once again we would like to thank Rob and his staff at Lambton Ford for stepping up and supporting not only our club but our community through this program. We hope the Second Chance Draw will encourage more fans to purchase 50/50 tickets in which all proceeds go back to minor sports in our community. Lambton Ford has been a long-time supporter and we can not thank them enough. Lambton Ford has been a proud sponsor of the Sarnia Sting since the team’s arrival in 1994. Over the years the relationship has grown with the team to the point where a partnership was created on many community initiatives. The most recognized event, the annual Teddy Bear Toss will celebrate its’ 21sy year this season. This year’s game will be held on December 8th vs the Kingston Frontenacs. With the support of Blackburn radio, other local media sources and the great fans of the Sarnia Sting, Lambton Ford has collected over 59,600 gifts for those less fortunate in our community. STEP 1: Don’t throw away your ticket. STEP 2: Follow the URL at the bottom of the ticket under the section Lambton Ford Second Chance Draw. STEP 3: Fill out the required fields under “Second Chance Draw” including your ticket reference number. Please Note: Only one entry per ticket, however fans can enter as many tickets as they desire to increase their number of entries and chances of winning. Formally known as the Sarnia Sting Booster Club, Friends of Sarnia Minor Hockey Youth & Education is a group of 27 volunteers who generously donate their time at all Sarnia Sting Home games to operate 50/50 and Jersey Raffles, the proceeds of which all go to local minor hockey and sledge programs in the Sarnia-Lambton Community. . The goal is to give our youth the best opportunity to play this great game by helping to keep registration fees as low as possible. Through the help of the Sarnia Sting and their loyal fans, Friends of Sarnia Minor Hockey has given back over $1,000,000 to local sport in our community.